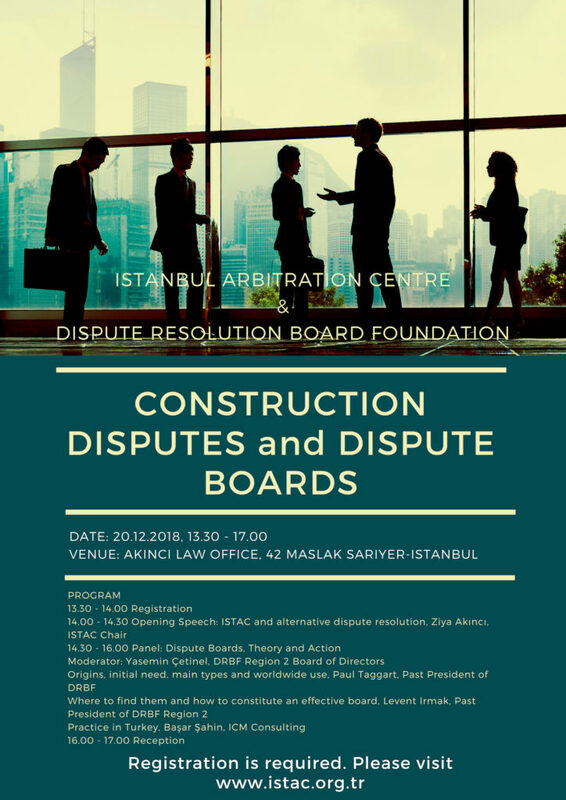 Istanbul Arbitration Centre (ISTAC) and Dispute Resolution Board Foundation (DRBF) are proud to announce their joint event “Construction Disputes & Dispute Boards” that will take place on 20 December 2018, in İstanbul. The event aims to provide participants with introductory information regarding construction disputes and dispute boards as well as the latest industry trends and developments. ISTAC and DRBF will host leading construction law practitioners as speakers, including Başar Şahin, Levent Irmak, Paul Taggart, Yasemin Çetinel and Ziya Akıncı. The event welcomes all practitioners involved in construction contracts and disputes such as engineers, contractors, in-house lawyers, construction lawyers, arbitration practitioners, experts, financial institutions and public entities. The event will be conducted in English and no simultaneous translation will be offered. Registration and payment must be made online by filling the above form. All banking charges associated with the payment should be borne by the party making such payment. The registration fee includes networking reception. Attendance is limited due to the capacity of the venue. All applications are accepted on a first come, first served basis. A substitute delegate is welcome at any time and no extra charge if you are unable to attend. Full payment will be imposed if cancellation is made within 5 days of the event date. This also applies to any “no-shows” on the day of event. All notices of cancellations or replacements must be made in writing to istac@istac.org.tr and must be acknowledged by ISTAC. Please note that ISTAC reserves the right to cancel (due to unforeseen circumstances) or to make minor alterations to the programme & speakers.